And what exactly is a "modded" pocket??? Well, in computer gaming parlance, a 'mod' is a alteration/variation you apply to the game to personalize it to your own specifications. I put a zipper on the pocket so it could be securely closed but still look nice from the outside. This was good for small things, but she also wanted to be able to have a bigger pocket on the inside to hold larger items. That was a bit more problematical, as any pocket attached to the interior needed to work around the existing exterior pocket. But, we worked out a solution. I had some mesh fabric that closely matched the color of the sweatshirt fleece. I made a *large* pocket for the interior but realized that would have a tendency to flop open because there was no structural integrity to the pocket. 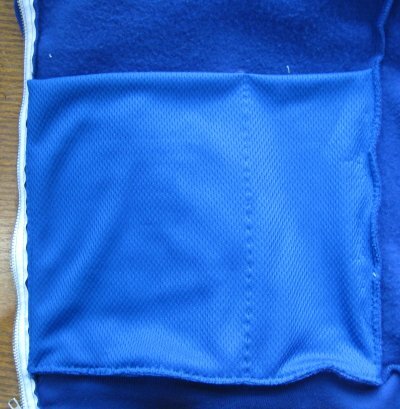 As a matter of fact, interfacing the pocket (which might have been an option) was rejected because any interfacing that would make the pocket itself sturdy would also make the pocket unduly stiff for wearing. So .. no interfacing. 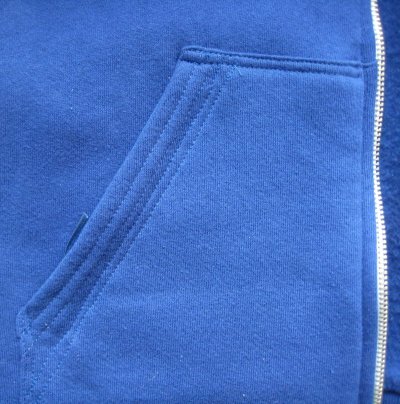 The edges of the pocket were zig-zagged to the existing seam allowances. Catherine agreed that subdividing the pocket into a large and a small section would be useful. But she didn't want the division line to show on the outside of the sweatshirt. 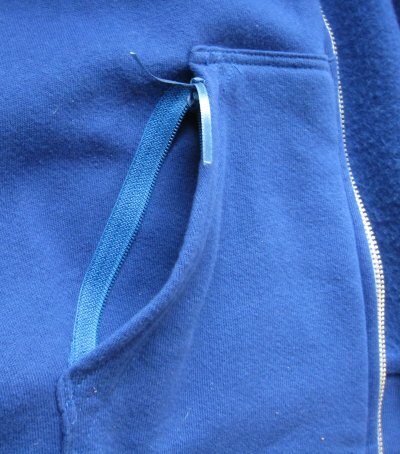 My first thought was to use a fusible strip to adhere the pocket fabric to the inside of the sweatshirt fleece. That resulted in a abject failure. Further investigation and pondering resulted in a hand-stitched line that held the pocket to the fleece but did NOT go through to the front. Catherine was pleased with the result. Unfortunately, I don't know how well this has held up through subsequent wearings.